Once summer hits, it seems like life gets really busy--it flies by so fast. Not a weekend goes by that we don't have some fun event to attend, like parties, showers, and weddings. It's the season, right? And the biggest decision is what to wear. We want our summer style to be comfortable, affordable, and adorable for summer. Get ready to make a splash this summer with outfits by JCPenney! I threw a 4th of July classy cookout complete with grilled goodies, homemade lemonade and s'mores (a must). Then we headed up to the roof and watch the fireworks. I live in Midtown, so I can see all of the fireworks around the city--it's an awesome view. 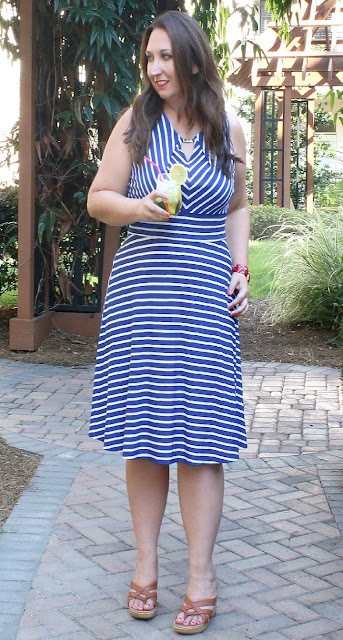 I wore this JCPenney Liz Claiborne Keyhole Bar-Neck Striped Fit-and-Flare Dress. It's super comfortable and is stretch knit. It's 4th of July without being costume-y. I love the fit of it too. A fave feature is the detail of the gold-tone metal bar on the front keyhole. 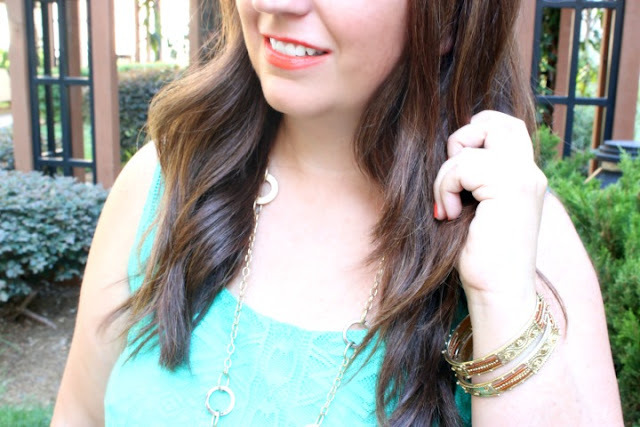 I can skip a necklace and instead rely on that patriotic punch of color with a red bracelet. I have worn this dress so much this summer! I recently wore this to an outdoor wedding and got so many compliments on the color. I wanted to be comfortable yet stylish and this JCPenney Alyx® Sleeveless Crochet Belted Dress worked perfectly. In addition to the textured detail on the dress, I decided to dress it up with fun accessories like the necklace and bracelets. There are so many options! Two outfits perfect for summer! Be sure to head to JCPenney for all things summer. love the stripe dress on you, so pretty. That striped dress is so pretty! Love the detail and it was definitely perfect for a 4th of July bbq! Looking great, Elle! <3 Ada. Love the striped keyhole dress, perfect for a summer party! Jealous that you got to see all the fireworks, we missed them this year. I'm not eligible for the giveaway but I just had to comment on how perfectly lovely that top dress especially is. And I think you accessorized it perfectly! What lovely looks for summer parties! I love al fresco dining on a cool summer morning or evening! I love JCPenny's - I always seem to get my purses there & love their Liz line. 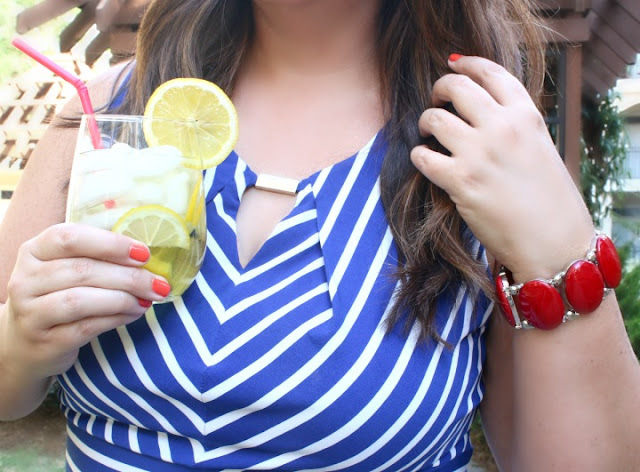 That striped dress is darling on you and was so perfect for the 4th! My fav thing about summer is going to the beach! Love the color of the second dress! I love cute summer outfits and bikinis of course to hit the pool or beach in. Love the nautical vibes of the first dress Elle! Summer is indeed the perfect excuse to polish your dress collection. I love the accessories you chose to play up the navy and gold accents. The second dress is sweet, flowly and everything I would wear to a summer wedding or brunch with friends. What an excellent giveaway Elle! I love your dresses! I always check in at my JCPenney every few months to check out what they have for each season. It is one of my favorite places to get dress pants for work and work out tops! What cute dresses--both just say "SUMMER!!" That minty turquoise color is beautiful on you too! Beautiful dress dear! Hope you have a lovely day. I love both dresses! They are so cute. The green one is my favorite. I like the detail on the front of the striped dress. The mint dress looks great on you!! Love your dresses! I'm a huge fan of JC Penneys! My favorite thing about summer is the longer days! Love the second dress its so pretty! you look great. I love cropped pants for the summertime and tank tops. Both of these styles are beautiful on you! The best thing about summer is getting some fresh air outside and exercising! I love to go biking and running in the summertime!! Both of these dresses are so cute! I love summer dresses with cute sandals. they both look fabulous on you, but the second one - the colour looks like it was made for you! gorgeous! That shade of green looks fab on you! Love both tho! Those two dresses are so cute on you! I love the colors! Summer is such a fun time for get togethers and enjoying the outdoors! Sounds like you definitely are doing just that! Both dresses are so pretty! but I love the stripes on the first one! I love seeing your outfits! I hope you'll do more :) The dresses are great, and perfect for Summer. I love both dresses!! They both look great on you and that teal color is gorgoues! Such cute looks, Elle! I love that mint dress. You look gorgeous! I love that I have no alarm clocks to set in the summer. I love JCPenney and shop there all the time! I also love breezy, stylish dresses during the summer. You look great! My favorite thing about summer would have to be sipping wine outdoors at one of the awesome vineyards around here. Both of these dresses are gorgeous on you! I love the stripes! I absolutely love these dresses on you! The green one looks especially lovely on you! Those dresses are beautiful. I only have two dresses currently that I can wear, but I'm hoping once the baby is born I can slowly go back to wearing the normal clothes that I've been dying to wear. Especially since I keep seeing all the new styles and fashions. Ice cream is my favorite thing about summer! Favorite thing about summer: time with friends. My BFF always takes a week off to visit me and we love our quality beach time! Beach fun is my favorite thing about summer. So pretty girl! And neither look too hot which is a must in this heat! I love both of the dresses on you. The fit, stripes on one and the colors-both great and you looked so pretty as always. My favorite thing about summer is the water, like being on the lake with family and friends on the pontoon listening to some tunes, I love it. I also love the beach and people watching. I would only get in the water enough to splash water on me to cool off but I may be staying by the pool rather than the ocean with all the shark attacks. My favorite thing about summer is that my grandkids get to come visit. We craft, shop, swim...and love it! My favorite thing about summer is spending time at the pool! Also, while I'm assuming you're not petite (it's hard to gauge people's heights from pictures), JCPenney has great petite clothing too. Probably a third of my clothes are from there! My favorite part of Summer is all the time I get to spend with my family. Lots of swimming at the lake, cookouts, walks, etc. Favorite thing about Summer is being able to wear all my cute summer dresses! I live in Michigan. So, my favorite thing about the summer is being in the SUN!!!! My favorite thing about summer is it is not winter! It's so nice to be able to enjoy being outdoors in the sun. I can go to the beach!! My favorite is spending time outdoors with friends & family, especially having bbq's. Thanks so much. I love busting out my summer wardrobe of sandals, jean shorts, tanks, and dresses! Thanks for the fun giveaway- I could use some new fall clothes. As for the summer, I LOVE being able to swim. It's wear I get most of my reading done in the summer and it's so relaxing. I love spending time at the pool with my children. Warm weather and eating dinner outside! Love soaking up the warmth! I am a photographer and, in the spring and summer, some of my best photo opportunities come during morning photo shoots in my own backyard. I love it! My favorite thing about Summer is hanging out near the water! My favorite thing about summer is iced coffee! My favorite thing about summer is the heat. I like being able to wear casual clothes and not have to keep adding layers to stay warm. My favorite thing about summer is the longer, warmer days. So many things I love to do outside! Hamburgers and ice cream in the summer time are my fun favorite foods! We like to go for long bicycle rides, packing our lunch for picnics. I posted a tweet: https://twitter.com/FireRunner2379/status/631972380974444545.